Katie Fyfe | The Journal Gazette The Komets’ Marco Roy, right, tries to maintain the puck during a recent game against Indy. 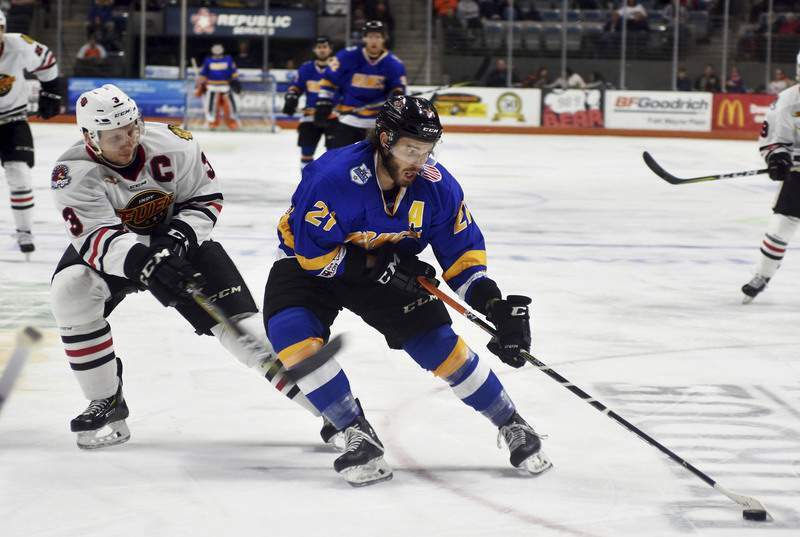 Marco Roy, who had 11 goals and 25 points in 26 games this season for the Komets, has been signed to a tryout contract with the American Hockey League’s Laval Rocket. Roy, 24, is no stranger to action in the AHL. He skated 12 games this season with the Chicago Wolves and had one goal and two points. He’s also played for Utica, San Jose and Bakersfield in his AHL career. This move may particularly scary for the Komets, who have already lost Phelix Martineau to Laval, which is short on forwards and likely to be so for the remainder of the season because of call-ups to the NHL’s Montreal Canadiens. Martineau, a 21-year-old rookie, has only four assists in 21 games with Laval, after he accrued eight goals and 14 points in 13 games this season for Fort Wayne. The Komets play the Kalamazoo Wings on Thursday at Kalamazoo, Michigan.